Outflow from the largest US oil-specific exchange traded fund (USO) reached $1 billion in April-May, Bloomberg says. It is the largest outflow in six years and raises concerns over a further rebound in oil prices. A total of $368.4 million has been withdrawn from the US Oil Fund this month, following $591.6 million in April, which was the biggest single-month outflow since April 2011, Bloomberg reported on Friday. Total assets are currently down from $3.25 billion since March, standing at $2.28 billion. “The oil rebound has run out of gas and now you are seeing nervous investors with itchy trigger fingers bailing out of USO. They don’t want to get burned by another drop in oil,” Bloomberg Intelligence analyst Eric Balchunas said. Investors poured $2.86 billion into the USO in the six months ended March 31 as oil slumped and started to sell when crude turned to growth.They used the 30-percent rebound in oil prices as an opportunity to reap profits. 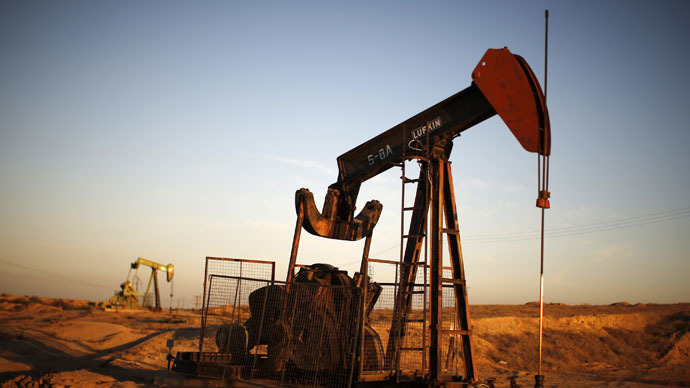 Oil rebounded from a six-year low in mid-March on speculations that the falling number of drilling rigs will reduce production and ease a supply glut. The number of active rigs in the US currently stands at 802, which is the lowest number since March 4, 2011. US crude stockpiles that are close to the highest level in 85 years, along with OPEC’s November refusal to cut production, will continue influencing oil prices, according to leading financial service providers Goldman Sachs, Deutsche Bank and Citigroup. US production climbed to 9.57 million barrels a day last week, the most since 1983, according to Energy Information Administration data. Inventories were 479.4 million, up 86 million from the previous year. OPEC, the group of 12 oil producing nations, has predicted in its long-term strategy report seen by Reuters that supply from non-OPEC countries will continue growing, mainly due to North American shale. The Organization of Petroleum Exporting Countries is meeting in Vienna on June 5 to discuss output policies. In November, the OPEC oil cartel decided to keep production high and provide no relief to the supply glut, aiming to gain its market share. WTI futures for July were up 65 cents at $58.33 a barrel by 15:10 MSK on Friday. Brent rose 63 cents to $63.21.